Virtue has long been linked to diet. As early as the fourteenth century Christianity has promoted earthly abstinence in exchange for spiritual rewards. During the forty days of Lent, Christians forgo eating meat on Fridays. When Easter arrives, carnivorous Christians often celebrate the end of meatless Fridays with a glistening ham or juicy leg of lamb. Jewish holidays are similarly rich with symbolism. The culinary components of the Passover meal work together to tell the story the Israelites’ flight from Egypt. As Easter and Passover approach, grocery stores stockpile matzoth, egg-dying kits, and lamb; yet, it is easy to lose sight of what the food means amid the din of holiday preparations. Springtime brings with it more daylight, glorious budding flowers, and an abundance of produce (think ramps and fiddleheads!). It is a time to celebrate the richness food can bring to religious and family traditions. These foods keep stories alive to nourish us in body and in soul. Passover celebrates the Israelites’ exodus from Egypt after generations of slavery. The word Passover references the Old Testament’s Book of Exodus, which chronicles God passing over the houses of the Jews after killing the firstborn child of Egyptian families. The observance of Passover calls for the removal of yeast from homes. This reminds celebrants that as the Jews escaped from Egypt, they left with such haste that there was no time to let their bread rise. Yeast-free breads are also a symbolic way to remove the arrogance from the soul. Matzoth, the grain eaten during Passover, is unleavened bread and made only with flour and water. Seder, a special meal eaten on the first night of Passover, is filled with ritual. Seder derives from a Hebrew word meaning “order,” because during this meal, the story must be told in a specific order. The Seder plate should include six items: the leg of lamb and cooked egg symbolize the sacrifice made in the Temple in Jerusalem, two types of bitter herbs represent the bitterness of the slavery the Jews endured in Ancient Egypt, and a ground mixture of fruits and nuts stands for the mortar used by the Jewish slaves to build the storehouses in Egypt. The Seder table also includes vegetables dipped into salted water to symbolize the tears shed by the Jews. Seder is a time for giving thanks to God for the divine intervention that led to the Exodus from Egypt and a future free of slavery. The special Seder foods are a way to pass on this story of Jewish faith. The word Easter comes from the name for the Anglo-Saxon goddess of light and spring — Eostre. As with many Christian holidays, this one has its roots in pagan tradition. Dishes were cooked in Eostre’s honor to ensure the coming year would be one of fertility. For Christians, Easter is a time to celebrate Jesus’s resurrection from the dead three days after he was crucified. Their belief is that the resurrection of Jesus gave a new birth to Christians and a chance to walk with God. The foods traditionally eaten on Easter are imbued with the symbolism of rebirth and the sacrifice Jesus made. What would Easter be without eggs? Whether hard-boiled, dyed, chocolate, or plastic and full of goodies, eggs are the embodiment of Easter. In fact, eggs have been colored, blessed, exchanged, and eaten as part of the rites of spring long before Christian times. When early civilizations held springtime festivals to welcome the sun’s awakening from winter, eggs were used as a symbol of the renewal of life. For centuries eggs were among the foods forbidden by the church during Lent. Because no one told the chickens about the boycott on eggs, there was always a surplus after 40 egg-less days. It was a treat to use these eggs for special dishes at Easter. As Christianity spread, eggs were adopted as a symbol of Christ’s resurrection from the tomb. Lamb is another symbol of Easter. The lamb connection originates in the Book of Genesis, which tells the story of when God tested the faith of Abraham (who is the father of the people of Israel) by asking him to sacrifice his son, Isaac. As Abraham held the knife above his Issac’s throat, God intervened and told Abraham he had passed the test. God then asked Abraham to sacrifice a lamb in place of his son. According to Christian faith, the devil can take any form except that of a lamb. The lamb is a symbol of Christ’s death on the cross and Jesus is often referred to as the Lamb of God. Jesus is thought to have sacrificed Himself for the sins of the world. On Easter Sunday, the lamb represents this sacrifice. Lamb holds a place of honor at the Easter table—and not only in savory dishes. 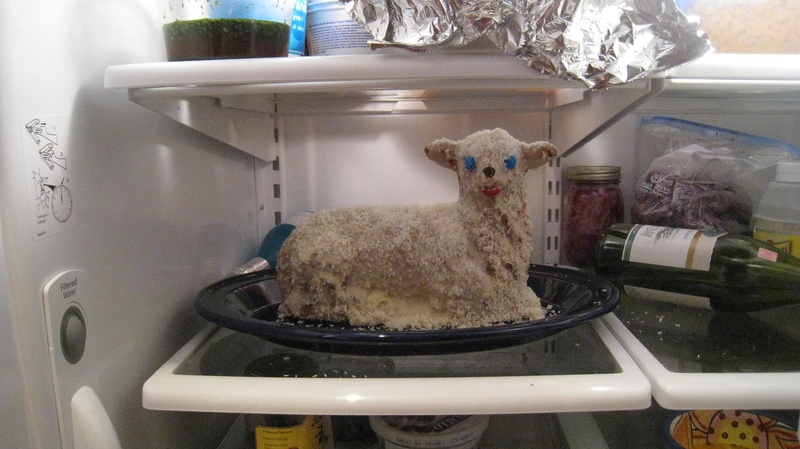 It is a long-held Christian tradition to include a “lamb cake” at the dessert table. The cake, baked in a lamb-shaped mold, is covered with white frosting and sprinkled with coconut. As we enter into the throws of Spring and its bounty, be sure to reflect on food’s role as a storyteller. That leg of lamb is much more than a succulent piece of meat; it carries with it a story as old as time.